It has been more than two months since I received my Automatic Link. When I first heard of this product, I was most excited about it because it would provide data on something I do everyday: drive a car. And once any form of data can be gathered it always reveals some unexpected trends. The second most exciting aspect about the Automatic Link is that its developers recognized that subscription costs are a burden for continuous long-term use and as a result, there is only a one time purchase fee and no annual subscription cost. Annual subscriptions are the norm for competing products. Most importantly, I do think this product fulfills an unmet need, especially for older cars where the onboard computers can rarely interface with modern computing devices such as smartphones. The designers and hardware engineers behind Automatic link had the brilliant idea of combining the data obtained from the the OBD port present in most American cars built after 1996 with bluetooth and geolocation capabilities of the iPhone. Before I get to the details of my review, I must express my biggest gripe with this product: its name. I do understand that the name Automatic Link makes perfect sense for what it does, but it is not a very good name when someone is trying to search for a review or has a question. The founders should have considered altering the spelling to make the branding unique and search engine friendly. For example, to find their community page I cannot type in 'Automatic GetSatisfaction' and expect that the page I am really looking for will be the top hit. Most search engines interpret Automatic as the adjective rather than a brand name. That however may change over time as the website becomes more popular. The Link costs $100 and is available from Amazon. It is a steep initial cost but if used the right way, it can quickly recover its cost in gas savings. In addition, since the Link has access to the OBD port, it can identify and suggest simple fixes for common Engine Light On problems, thereby saving a trip to the mechanic and once again, potential savings. This adds to the value proposition. The company's customer service is excellent to say the least. I had some delivery issues with my hardware unit and sent an email to Automatic's customer service and received a quick response from an actual human being. After looking into the issue, the customer service agent quickly resolved my USPS delivery problem. The link also has an enthusiastic fanbase and customer service agents available for listening to feedback on their getsatisfaction community page. There are dedicated threads to feature requests and customer issues. All in all, this is an efficient way of addressing customer issues quickly. In fact, questions are often answered by fellow users and rarely necessitate official intervention. It is evident from the Automatic Link hardware, the packaging and the app's user interface that the team is obsessive about design and has put a great deal of effort into refining small details that matter. For example, the link itself is nicely contoured and feels sturdy because of the sturdy plastic exterior, even though the reality is that once set up, the user will rarely see the Link again. The white/gray color scheme does add to the serene, sophisticated look of the product. Setting up the link involves pairing the bluetooth of the Link with that of the iPhone. In my case, I have an iPhone 5S and a Toyota and pairing took some trial and error. In the end, I had not done anything different from the provided instructions that came in the product's box, except trying several times. This setup was performed two months ago, and since then I have never interacted with the Link dongle which is now permanently stuck in my car's data port. After the initial setup with the hardware and the app, almost everything happens automatically thereon, as the Link's name promises. In iOS7, the app runs in the background and responds to ignition and starts gathering data and inactivates when the ignition is turned off. This does mean that the app needs to keep running in the background, and thus if the phone is turned off and turned back on, the app needs to be launched once so that it can respond to on/off signals from the hardware. I have not had a first hand experience with this matter, but I understand that because the iPhone bluetooth is dedicated to the Automatic Link while driving, other bluetooth devices such as earphones cannot be used simultaneously. 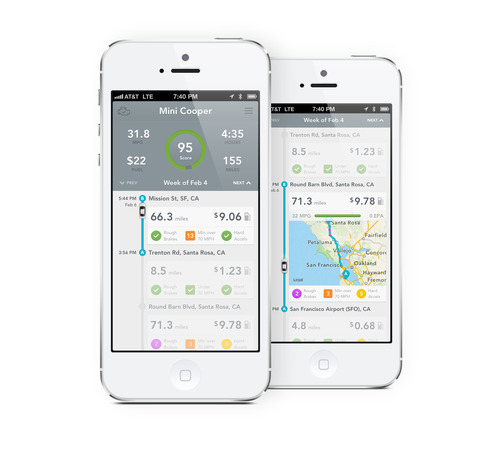 The primary functionality of the system (the Automatic Link hardware, together with the iPhone app) is to provide realtime feedback on fuel-inefficient driving characteristics to the driver while driving through audio alerts and to calculate drive metrics such as distance, time and cost once the drive is completed. The secondary functionality is pinpointing a parked car's location. This not only is helpful when a person forgets the parking location, but also in fact, frees the driver from the burden of taking notes every time he/she visits a new area. The caveat here is that many parking multi-level or underground parking structures do not have cellular internet signal and in those cases, the driver would need to manually take note of the parking spot. This becomes harder and harder as one gets used to the characteristic park-and-forget convenience of Automatic. Another aspect of the app which hopefully no one ever should need to use is the Crash Alert functionality which detects a car crash and alerts designated friends and/or family via a phone call from the company's call center. 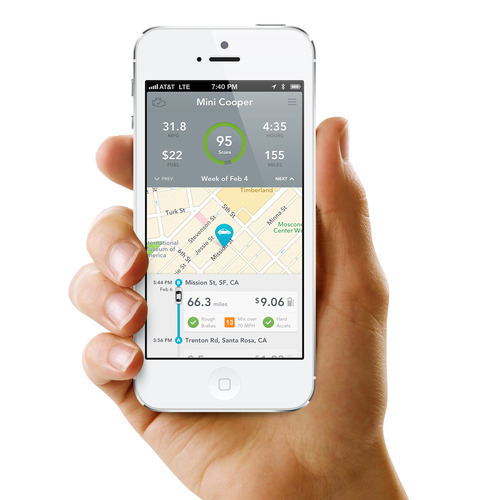 At the end of each drive (ignition-on to ignition-off), the app calculates and displays the start and end time of the trip as well as the distance traveled, incorporates the local gas price to find the trip cost and mileage (MPG) estimate and provides a driving quality score. This score displayed prominently in a large, bold font is central to the Automatic philosophy and is equally split between hard accelerations and hard brakes. The notion is that these lower the fuel efficiency of a car. Several Automatic Link owners complain that in the geographical region that they live in, the allowed speeds are higher than the 70 mph at which the app starts presenting audio beep alerts. In doing so, they are ignoring that the fundamental notion behind the 70 mph is not the speed limit, but fuel efficiency. I suspect that as the company gathers more and more data on thousands of cars driving millions of miles, they will be able to refine their scoring algorithms and define specific optimum characteristics for each make and model of supported cars. Based on the questions, comments and feedback posted on the community website, it becomes apparent that at this juncture, the vast majority of the target market for this product are the data-hungry geeks. There is a minority of users who bought the Automatic Link because they share a vehicle with another person and the ability to locate where the car is parked without having to ask the other ride-sharers is desirable to them. Users have experimented with the data and produced interesting results such as this one showing that the driving efficiency drops as more weight is added to the car or this one that the device pays for itself. One criticism of the Automatic has been that it is simply a feel-good accessory. In my experience however, this has not held true. Even the simple audio beep when braking hard or accelerating has a strong negative feedback effect on the driver and over time, driving improves. Secondly, the monetary savings as well as the absence of any subscription cost for services like Crash Alerts for the duration of the system's life justify the initial device cost. Of course, as with any first generation product there is an immense scope for improvement and I am sure the company is hard at work on implementing the many suggestions its users have offered. At this stage, the Automatic Link can be likened to the first iPhone or the first iPad. These products had flaws, but they were radical improvements to the status quo because they represented a new way of thinking about a product category. Early adopters paid a higher price for the first generation product and yet raved about the quality and attention to detail. This drove mainstream adoption and increased volume drove per unit price down. I anticipate a similar future for the Automatic Link, and it is possible that they may strike deals with car manufacturers so that the Link could come pre-bundled. If I had to pick one feature that should be immediately added to the Automatic Link system, I would ask for raw data. This, of course, would concomitantly recognize that the majority of the existing customers are in fact data geeks who would like to experiment and find trends using their own driving habits. For example, I would like to know what is the optimum time for leaving home for work so that my morning commute time is minimal. Overall, I am highly satisfied with my own Link and the accompanying iPhone app and have enthusiastically recommended it to friends and family. ** Amazon page for Automatic Link.